Yesterday, this truck arrived just in time to allow me going shopping to the market, next village ! 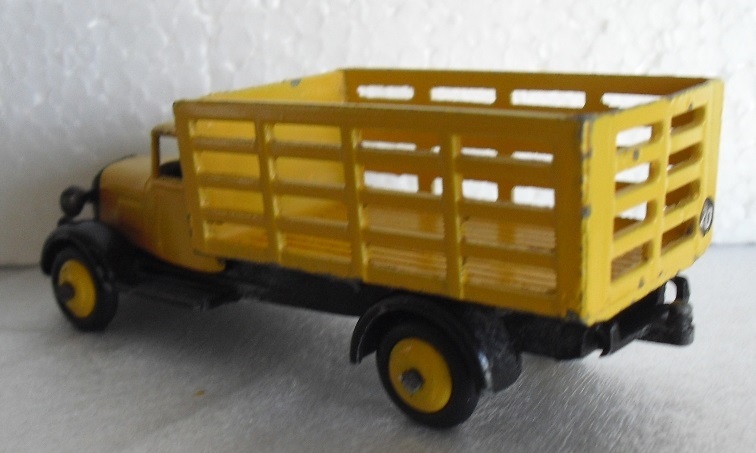 This morning arrived my first Guy Vixen flat truck. If I understood well what I read on the topic, it's a "432" ! Quite some colours still to go, Richard, but this is a fine start! Yes, you are right ! There are some others items to find ! 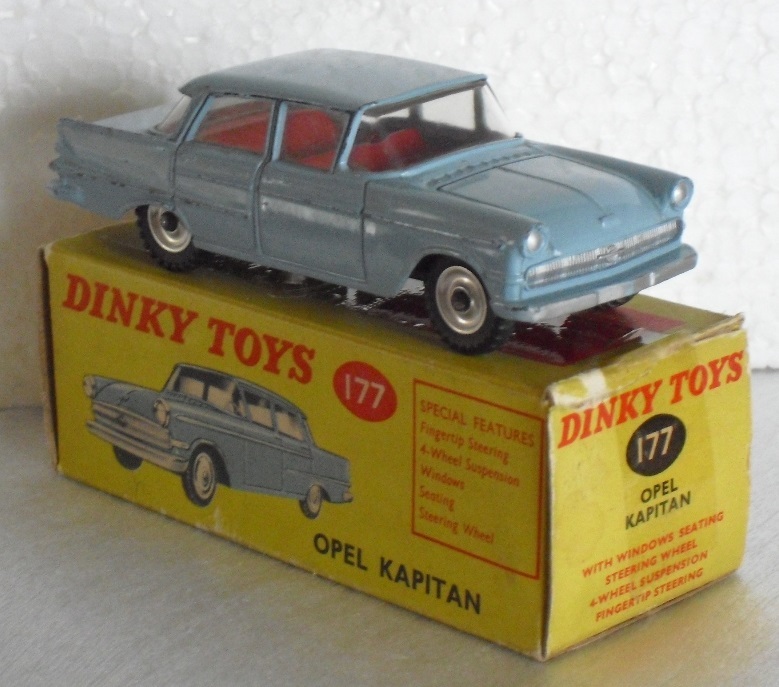 It's not like the Opel Kapitan, that I received this morning which has no variation made in Europe ! I don't think that I will have, some day, a south african model ! Your book seems mervellous ! What a work ! I suppose that you will sale some in the future. Let me know. Congratulations for your new book. It looks absolutely fabulous. I am sure that everybody is looking forward to some more photos. 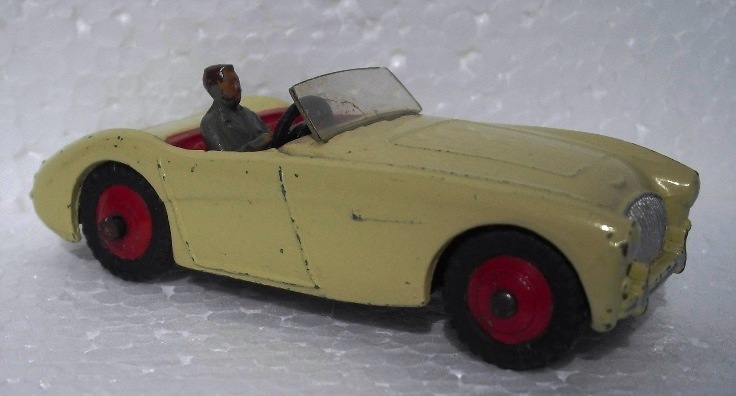 Last week arrived an Austin Healey with smooth tyres. I wasn't sure where to put a comment unrelated to a specific model, but I wanted to say that I am trying to go through my old posts on this sight and trying to fix images that I had previously used Photobucket. Those images are only a link now, so I am deleting that link & attempting to re-post the same images directly from my image file. Terry, your image restoration project is obviously in full progress, good to see! A new addition to my collection is the yellow version of the no. 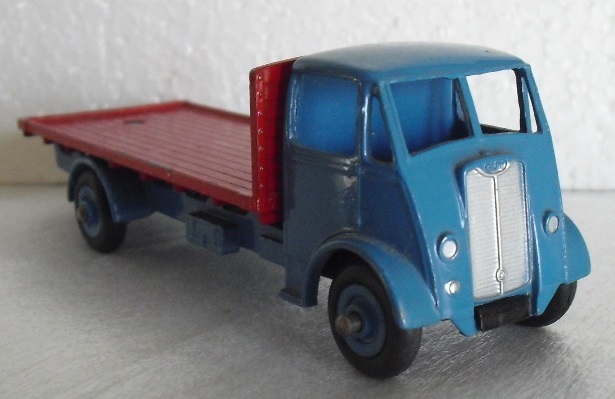 33C/579 Simca Cargo miroitier Saint-Gobain. A wonderful example of this slightly less common colour finish, a companion to his already present grey brother. The green of the loading platform is brighter than the darker green of the grey one. Jan--Another very nice addition, and it seems the color yellow does suit many of the models very well. I only have the grey version, and at times have wished I had found a yellow one. Nicely done! A very nice addition and looks to be in perfect condition.Well done! PS One of my last additons is the 138 Hilmann Imp in metallic red with a red interior. Not an easy find. As I just took some more photos of my last pre war additions, I will share them as well. 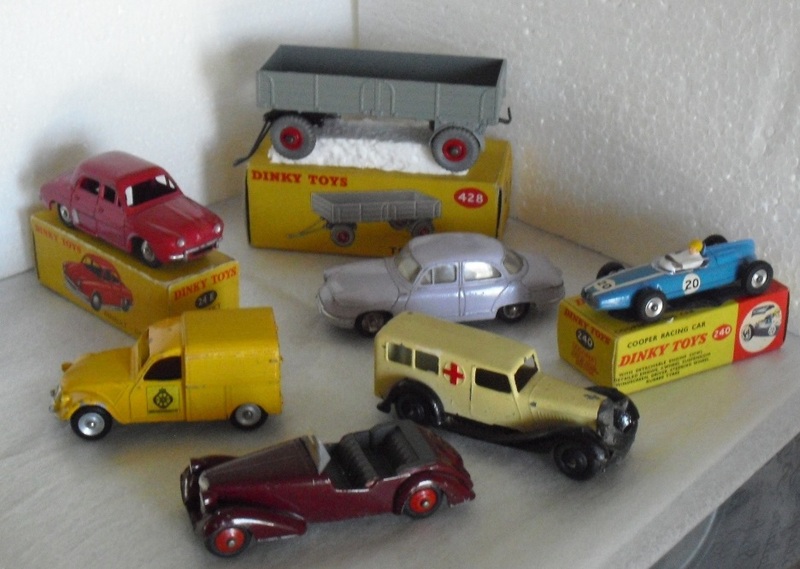 I have been buying more pre war Dinky Toys the last two years. I try to find them fatigue free, which is easy with a lead model like the Tractor below. Rob-- Beauties!! 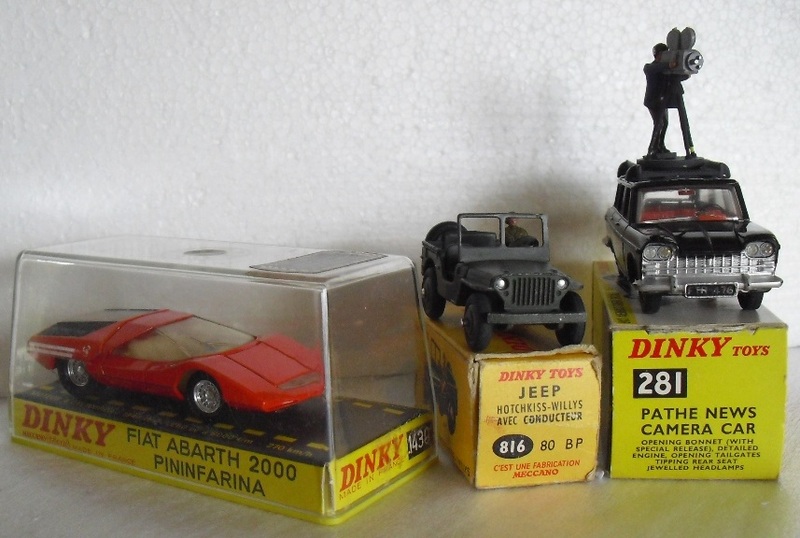 It took me many years to finally take the plunge into acquiring some pre-war Dinky models, and I have never regretted it. They really are quite a bit different than their post war brothers, but I have always felt they had a certain charm, which post war could not be duplicated. And I enjoyed the various forms used....diecast of course, but also a fair amount of tinplate, and those wonderful scenes that were painted on many of the box displays. That, and the hand painted detailing on many subjects, such as the figures or the motorcycles.......all something to appreciate! Yes, it's a very pleasant toy and the colours fit very well. I was away for 15 days and when I came back last monday those Dinky was waaiting for me ! That's a very nice early post war Ambulance with the open windows, and that Alvis looks very nice too. You got several nice ones there! It's the third and last version. I was waiting for a long time to find this Ambulance ! Unfortunately, it has some black paint retouches on the wings. Richard---Regarding the early post war ambulance, still with windows......after I saw a photo of one many years ago, I decided I really wanted one, but for a long time, no decent ones showed up. I even thought about having the later version modified by carefully removing those windows & then restoring it like original, but that really isn't practical. Then, all of a sudden, a very nice one appeared on eBay, and I quickly bought it. After receiving it, I fully realized just how nice it was.....wonderful bright, crisp paint, still lots of plating on the radiator shell, and as a final bonus, it featured the smooth, non-ridged wheels, dating it to around 1946 or so. Here is a quick photo...to me, it looks so much better with those windows! Yes Terry. It's also my opinion. This ambulance looks much better with the open windows. Yours is in the grey colour and looks as new. Very nice. 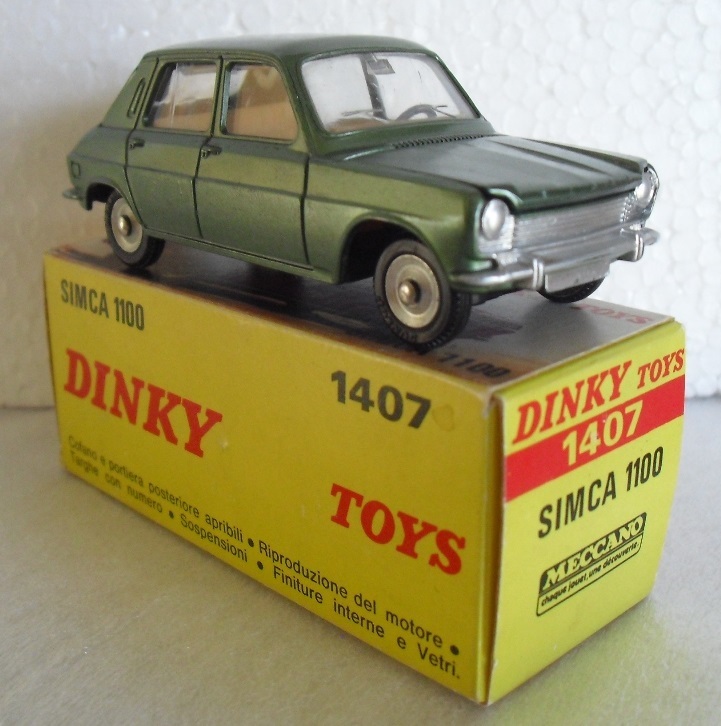 Yesterday I received this Simca 1100. I already had it but without box and number plate. I have a questio but I do not know where to put it so it is as well here than any where else. What do you call in english the action of riveting a base plate to a die cast body. In this case the word "riveting" is not correct because there is no rivet. Strictly speaking you are correct but I cannot imagine any native English speaker saying that you are wrong. The action of expanding the head of the spigot is exactly analogous (in my humble opinion at least) to the expansion of the shank of a rivet. This operation might be referred to as "peening" but most people would commonly use "rivetting". As long as I'm here let me inform you of the safe arrival of your CD Encyclopaedia, for which many thanks. The finishing of the spigot is often referred to as "spinning over", but I suppose the technically incorrect term "rivet" has become commonplace. Thank you John and Kevin. Spun over seems right.This is not the sort of things that one finds in the dictionaries, even the technical ones. John, when you have had a good look at your CD, please let me have your comments. I shall be happy to give you feedback when I've explored the CD Jacques. I shall have to replace my elderly laptop computer first as it overheats very quickly. 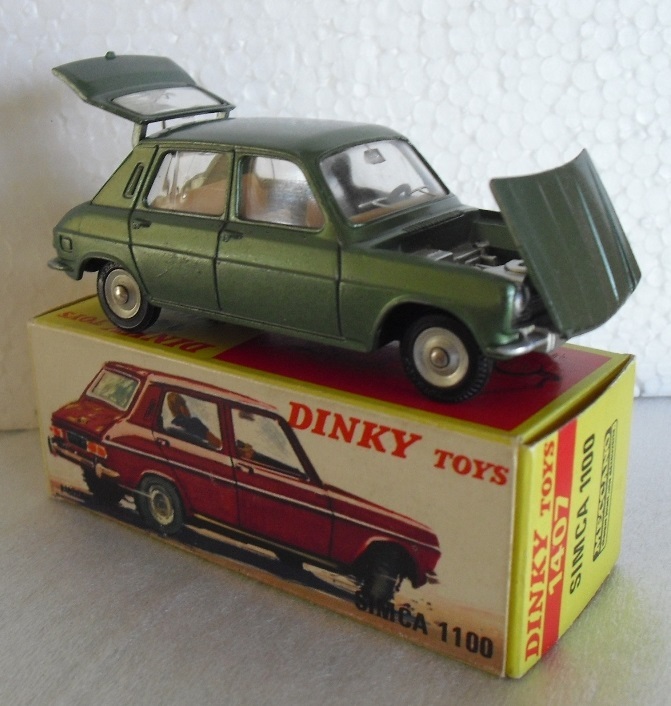 Jacques-----My Dinky Toys Encyclopedia is now several years old.....have there been many changes or updates to warrant getting a new one??? Both trucks arrived this morning. As you can see, the gas tank is the Horny train model with it's own different transfers. Your Encyclopaedia is dated 05 30 2014. Of course a lot has been added since, even this last week as there has been a meeting of the French DTCA members and I have taken some fifty pictures and discovered more variations. It is up to you if you want to get the last edition. At the end of last week, 3 new arrivals came in cabinets. 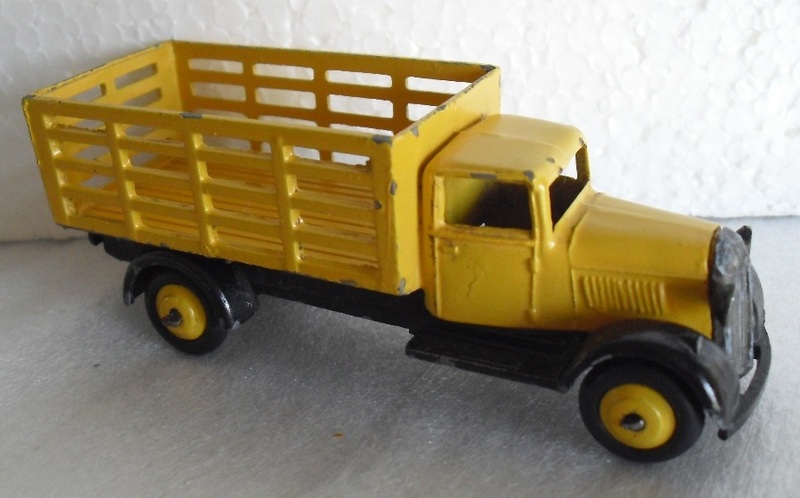 For the anecdoote, Collectoys in Bourges was saling this model 3 weeks ago in a live auction. I lost it. The winner bought it for 300€ + all charges. Two days later, an another one appears, this time in a live auction in Chartres. I had the pleasure to win it for 190€ + all charges. Finally we always have interest to be patient.